Ecards are very similar to postcards, both in size and design, containing the design on the front and an area on the reverse to include a message or note for the intended recipient. The only difference is that ecards are sent via email rather than through the post and the recipient will have their card in a matter of minutes. The possibilities are endless with our e cards designs whether you choose the Mountain lake one or another from our portfolio of designs, your recipient(s) will be pleased with their surprise ecard. 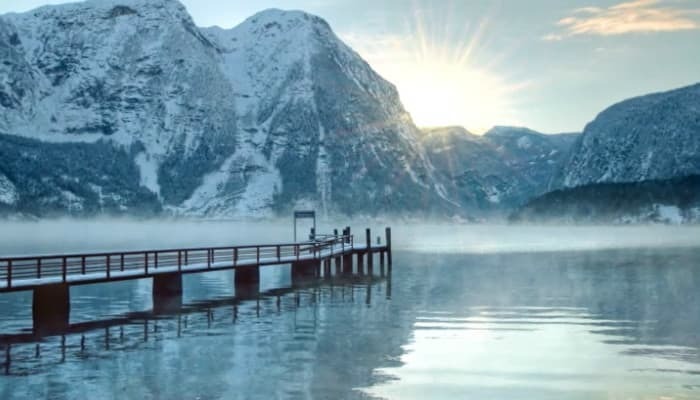 The mountain lake is the perfect winter scene which makes this ecard an excellent, meet neutral choice for sending to business people. Save money with our skilfully created ecard templates! The ecard along with many of our other Christmas ecards for business epitomise how we image a Christmas holiday scene.